Just thought I would update The tips were good, I got the water consumption down to something reasonable so thanks for the advice. Then the muncher pump packed up. I managed to fix it but I ended up taking the whole shooting match out and replacing it with a cassette, no more anxiety about whether it is going to flush or not ? Is this really how a bowthruster is fitted? Ok Our new boat has a Tecma macerator bog. We have always had cassette type before. On about two flushes a day it is emptying the fresh water tank into the black water tank and we have to pump it out then refill fresh water ever 6 days. It seems to use a collossal amount of water. Is there something wrong here, can you adjust the amount of water it uses? Or is this just what they are like? The fresh water tank is a similar size to our old boat and a tankfull would normally last us 3 weeks of normal use. Thumbs up for Bailey's coach enamel from me. 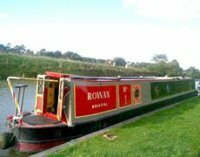 Me and mrs did the whole boat last summer on the shropshire underneath the M54. Great finish with just a Harris brush and some sandpaper. It does dry fast though so you have to be well prepared before you start. But that means you can paint a coat on, and by the time you have cleared up and had some breakfst the paint is dry enough foy you to set off on your travels again! man1nvan replied to Chico's topic in New to Boating? Is it necessary to black the bottom? Funny one really I always epoxy everything under the waterline. I have just spent the morning rotoblasting and epoxying the baseplate of our new second hand widebeam. Given that it is 10 years old and doesn't appear to have ever been blacked "down there" I am quite surprised at how shallow the pits are. Most of the corrosion is galvanic (electricity corrosion) which isn't surprising as it seems to have been fitted with every type of gizmo available (still not sure if a full size freezer is actually necessary) my first narrowboat (a lovely old dartline) had no worse pitting despite being 25 at the time. But the most sophisticated gizmo on that boat was a gas hob. I suppose the answer is paint it unless you want to spend a Sunday in the year 2028 waving a grinder around near to your face whilst laying on your back in a puddle.